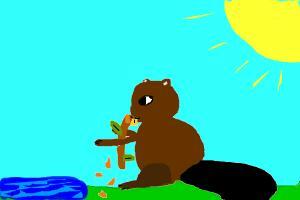 The beaver is a primarily nocturnal, large, semi-aquatic rodent. Beavers are known for building dams, canals, and lodges. They are the second-largest rodent in the world. Their colonies create one or more dams to provide still, deep water to protect against predators, and to float food and building material. Are you looking for a tutorial on How to draw a Beaver? You've found the right one here. Begin your tutorial by drawing its head, muzzle, facial features, body, and tail. Next remove any unwanted sketch lines and add in the tiny details. Finally in How to draw a Beaver tutorial, color its body brown, belly off-white, and tail reddish-brown.